I was a bit skeptical of it at first. Definitely something I wouldn’t like, I thought when the idea was presented to me at lunch. But as I pondered over my pasta, I decided to take the plunge. After all, we aren’t talking about Trapeze School here, one of those Club Med activities that gives me agita at the mere thought of. 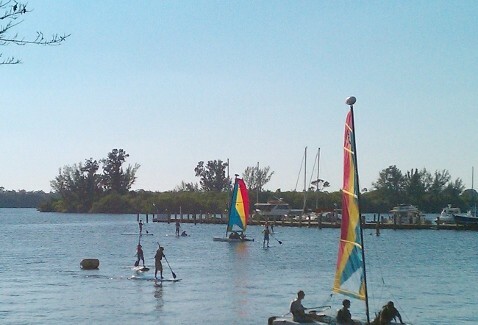 No, we were talking paddleboarding on Sandpiper Bay. The concept is pretty simple. Surfboard plus paddle. It’s almost an extreme kayak, but without the white waters. So the group of us – I think there were six – went to our rooms to change after lunch and made a beeline for the beach. The paddleboards are free to use which is nice, and after suiting up in a life jacket, we were fresh out on the water. Ryan, Jeff and Ross were quick to stand up and paddle. They’ve done this a lot before. Marsha, decided to try it sitting down – and Kristin and I were somewhere in between. Kristin tried, but never quite made it all the way up. She had a great time though and really started to get the hang of it after a few minutes. I had a similar learning curve. Getting on the board was pretty easy, and paddling was simple enough… as long as I was kneeling. See, it turns out that I have a low center of gravity – I think it was somewhere in the water a foot away from my board because every time I tried to stand up, I took a header into the bay. On my knees, I did very well though – scooting around the bay quickly. Club Med is a great family destination and with over 80 locations around the world, there’s a lot to choose from. Call your Crown Cruise Vacations agent today, and you’ll enjoy a very special offer for each room reserved. You can talk to your agent by dialing 877-283-1114. This really was an amazing time. For someone who thought they were more of a cruiser, I sure did love not having to be tied to a schedule and being back on a ship at a certain time. It was great to say “Hey let’s go paddle boarding, or playing volleyball, or try the trapeze.” I highly recommend going to Club Med Sandpiper, or trying any other of the fantastic Club Med properties in the Caribbean. This was my first experience at a Club Med and I’m hooked (almost as much as I am to cruising). I loved all the outdoor activities they had planned. I enjoy volleyball but never have people to play with. They have organized games everyday and it was a great way to make some friends. I learned to rollerblade for the first time here. I was really glad to learn in a safe environment. The biggest surprise was how good the food was. It’s shocking that an all inclusive pays as much attention to the menu that they do. Best treat was the fresh loaves of bread they bake each day. My family and I were even able to take a few with us on our last day. The staff here is great and it felt like they really went out of their way to make it a wonderful vacation for us. I look forward to returning.